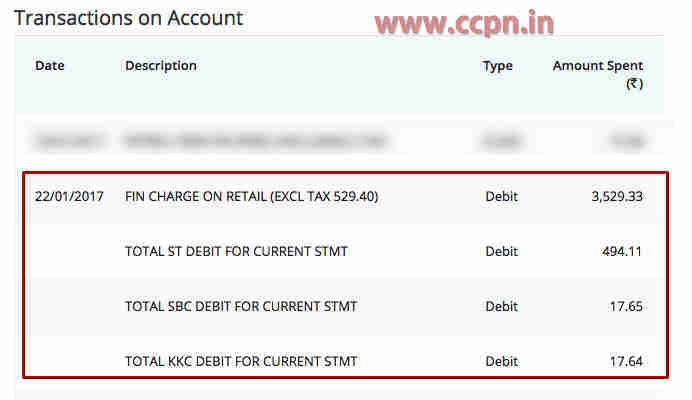 What are Total ST, SBC, KKC Debit Charges in Credit Card Statements ? Are you using credit card and your card is showing charges like Total ST, SBC, KKC Debit ? Allot of questions might be raising in your mind. This page has the solution for that. Few people have been seen complaining online forum complaining about irrelevant charges in their Credit Card statement. The above screenshot belongs to SBI Credit Card in which they have charges interest on the credit amount which we have used. If you have purchased something on EMI or you have just paid the minimum amount and interest charges have been charged on the rest of the amount. Then you also have to pay taxes over that amount. In above image you can see that I have been charged interest on my SBI Elite Credit Card. It has been written in the form of FIN CHARGES ON RETAIL which means Finance Charges. Ahead that you can see EXCL TAX 529.40. It is the tax amount on Finance Charges which we need to pay as per Government rules and it is exclusive of that amount. If you calculate it, than you will find that we have been charged with Service Tax (ST) Rs. 494.11/-, Swachh Bharat Cess (SBC) Rs. 17.65/– and Krish Kalyan Cess (KKC) Rs. 17.64/-. So, I hope it is clear to you that these are the taxes charged over your interest charges or Finance Charges. Are this charges one-time or these charges are applied on every EMI ? Thanks, writter for your valuble time and info. Next post: What are FIN CHARGES ON RETAIL in Credit Card Statement ?